While Dr. Weston Price has spent more time studying the human use of dietary clays, he isn't the only world traveller that has recognized unique behaviors involving unusually wise clay eating habits in nature. "Here's a different view of the claylick where a group of parrots are enjoying the morning "feast" on the main claylick outside the Tambopata Research Center. The claylick is pretty much a simple cliff face. Somehow all of the birds know that if the clay they eat in the morning will dispell the toxins in the poisonous fruit during the day. They only need to eat clay during the times of the year when the non-poisonous fruit is not available. Many species of parrot know to do this. How do they all know? When did they learn? How did they discover this amazing property of the clay and propagate it to the rest of the parrots?" As referenced below, Professor Diamond masterfully-- and quite correctly-- sets the record straight concerning the exact reasons that parrots ( and many other animals ) seek out clay as a supplement to their diets. In the parrots' case, the decision to use clay is one of life and death. As our world becomes a far more toxic place to live, one might wonder if the same situation may be applied to mankind. "The commonest explanation for geophagy in birds is to provide grit8. Because birds lack teeth, many ingest pebbles or coarse soil with which to grind food in their gizzards. Preferred particle sizes of grit increase with bird size, from 0.5 mm for sparrows to 2.5 cm for ostriches. However, Gilardi et al. found that the soil preferred by Peruvian parrots is very fine: only 5% of it by volume is coarse sand exceeding even 0.05 mm in particle diameter. Most of it is clay less than 0.2 m in particle diameter, and preferred soils contain only a quarter as much coarse sand and nearly twice as much fine clay as rejected soils. So parrots are not eating soil to get grit. On reflection, this is not surprising: parrots have no need for grit because their strong, sharp bills can shred the hardest nuts. "A second function of geophagy, suggested for livestock, wild ungulates, rabbits, butterflies and pregnant women, is to provide essential minerals6,7..."
" ...But Gilardi et al.10 found that soils preferred by parrots contain lower available quantities of most biologically significant minerals than non-preferred soils, and much lower quantities than the parrots' preferred plant foods..."
"...A third function of geophagy, proposed for ungulate livestock, is to buffer the rumen contents6. Because parrots lack a rumen, it will come as no surprise that their preferred soils have no more buffering capacity than distilled water. "What, then, do the parrots actually gain from ingested soil? It turns out that they regularly eat seeds and unripe fruits whose content of alkaloids and other toxins renders them bitter and even lethal to humans and other animals. Because many of these chemicals are positively charged in the acidic conditions found in the stomach, they bind to clay minerals bearing negatively charged cation-exchange sites..."2,3,5,9. 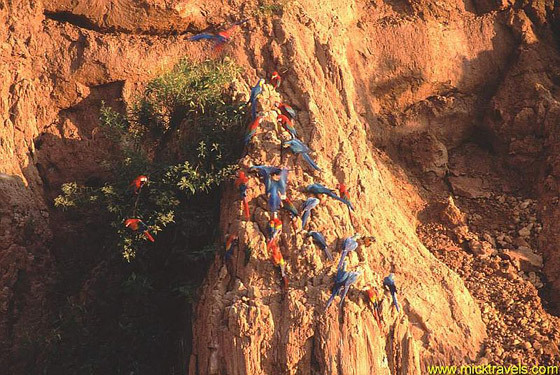 "...Peruvian parrots behave like sophisticated human tourists and hunter-gatherers. Their preferred soils were found to have a much higher cation-exchange capacity than adjacent bands of rejected soils -- because they are rich in the minerals smectite, kaolin and mica. 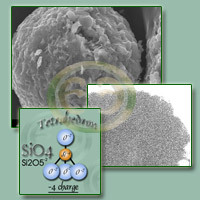 In their capacity to bind quinine and tannic acid, the preferred soils surpass the pure mineral kaolinate and surpass or approach pure bentonite. Clearly, parrots would be well qualified for jobs as mining prospectors. "Gilardi et al. confirmed this hypothesis with two sets of bioassays. First, they exposed brine shrimp (the toxicologist's test animal of choice) to extracts of seeds routinely consumed by macaws. Many of the brine shrimp died, confirming the toxicity of the parrots' diet. But mixing the solutions or extracts with soil preferred by parrots reduced the effective toxin loads by 60-70% and improved shrimp survival. Second, Amazon parrots were given an oral dose of the alkaloid quinidine with or without preferred soil, and quinidine levels were measured in the parrots' blood for three hours as absorption took place from the gut. Providing soil along with the quinidine reduced absorbed quinidine blood levels by 60%." as quoted from Nature 400, pp. 120 - 121 (1999) © Macmillan Publishers Ltd. The use of volcanic ashes internally is almost older than civilization itself. Primitive tribes of various continents have used various types of clay for conditions of toxicity. Dr. Weston A. Price in his book, "Nutrition and Physical Degeneration:, pages 266-267, stated that in studying diets of certain tribes he examined their knapsacks. Among those examined in the high Andes, among those in Central Africa and among the Aborigines of Australia he reported that some contained balls of clay, a little of which was dissolved in water. Into the clay were dipped morsels of food. The explanation was that this was to prevent "sick stomach". These people were reported to use the clays for combating dysentery and food infections. In South America he found that the Quetchus Indians, believed to be descendants of the once powerful Incas, were largely vegetarians and he stated, "Immediately before eating, their potatoes are dipped into an aqueous suspension of clay, a procedure which is said to prevent 'souring in the stomach'." Yet, only comparatively recently has the white man apparently begun to use kaolin, one of the clays. Apparently primitive man was not a dumb as the modern white man has often assumed. For one reason or another, certain conditions of toxicity can occur in the human body - which past experience and results of the experimentation reported above indicate can generally be aided by action of hydrated bentonite upon the alimentary tract. Note: Throughout the above report on hydrated bentonite various conditions ( such as diarrhea, virus infections, and the like ) are referred to in reporting certain results of scientific experimentation. Such references are made in the interest of providing a full report concerning such experimentation and not for the purpose of offering hydrated bentonite ( either as such or under a specific product name ) for such specific conditions. 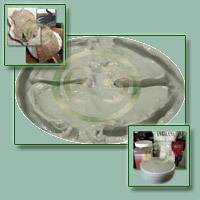 Such hydrated bentonite is offered solely as an aid in detoxification via the alimentary canal, and is not offered for any other use except as the same may be prescribed only by a qualified and competent medical person. Certain so-called authorities may disagree with one or more of the conclusions expressed above. Nevertheless, we believe such conclusions to be based upon reputable and substantial scientific authority. Reprints of this circular or reprints from the Medical Annals of the District of Columbia entitled THE VALUE OF BENTONITE FOR DIARRHEA are obtainable from V.E. Irons, Inc. at .03 cents each, or ( 10 ) for .25 cents, or more ( 25 ) or more .02 cents each. 1. Boyd, E.M., in Drill, V.A., editor: Pharmacology in Medicine, 2nd ed. New York: Blakiston, 1958, p. 696. 2. Goodman, L.S., and Gilman, A.: Pharmacological Basis of Therapeutics, 2nd ed. New York: Macmillan, 1955, p. 1020. 3. Bastedo, W.A. : Pharmacology, Therapeutics and Prescription Writing, 5th ed. Philadelphia: Saunders, 1947, p. 167. 4. Oker-Blom, N., and Nikkila, E.: Ann. Med. Exp. Fenn., 1955, 33, 190. 5. Mussgay, M.: Zbl. Bakt [ orig ], 1957, 169, 12. Dietary studies of descendants of the Incas of long ago, reveal clay eating as a common practice. When their ancestral mountain empire was ravaged, the last of the Inca's rulers escaped deep into the Andean mountains. They took with them supplies of clay, which were valued even above the treasures of the empire. They were transported by human carriers to the secret city. The ransom for prisoners was often paid for by edible clays rather than silver, in that same period. Studies of some Indian people who are most surely descendants of the ancient Incas, reveal they existed largely on a vegetable diet. These vegetables were dipped in an aqueous suspension of clay. This dietetic procedure of very ancient origin is universal among these Indians today. Dr. Weston Price, a researcher studying primitive races of the high andes, Central Africa, and also the Aborigines of Australia, asked for the privilege of seeing what the natives carried in their knapsacks. Without exception, each one contained a ball of clay, a little of which would be dissolved in water. Their morsels of food would be dipped in their mixture before being eaten. This practice is carried on today and is undoubtedly one reason the people of these cultures experience physical stamina and endurance. As the explorers came to the New World, they observed the American Indian using various clays. Some of these uses were: The face mask of a proud warrior, the painted body of a ceremonial dancer, or a cool clay pack on an exhausted messenger. Al contained special clays usually gathered locally. However, those for eating were highly treasured and to secure a supply, the natives often traveled long distances. The use of clay was introduced to the pioneers through the skills of the native Indian women, who on occasion were taken as wives by the white men. However, the gathering of the clay had traditionally been done by the men of the tribe, thus substitutions began to occur in the white villages. Slowly the effectiveness of this healing art was lost. Clay was used in sacred ceremony by the American native. In these rituals, they reverently acknowledged the intimacy they felt with mother earth and all nature. In deep reverence they partook of the sacred clays, believing the clay and water that flowed from the breast of mother earth was to nurture their spirits, as they believed the flow of a mother's milk was given to feed the spirit of the infant. By Indian tradition, the tribal father sought visions to guide his people. While solemn ceremony, he might perceive spirits petitioning birth into his clan. Lengthy preparation including clay ceremonies would then follow. Tribesmen would leave the village together for several weeks to go through purification. The tribesman's knowledge of plant life and clays used to predetermine male offspring was held in reverent secrecy. Observation of the moon as well as instinct directed the time for their return and the completion of conception ceremonies. The participating women prepared for the sacred rites at the moon lodge. Upon the birth of their infants they would return to the lodge for further ceremony. As the moon rose in her full majesty, sacred clays were place upon the infant as a symbol of protection from lurking spirits. Should a maiden of the tribe be violated by a vagabond, she would go to the village outskirts in solitude to heal her spirit and restore her virginity. She used food and clays daily that had been blessed by the spiritual father, as she shamelessly sought her purification. Heat lodges were a common practice of most tribes. Some sweats lasted a few hours at the day's end. Other sweats were held deep in the heart of a mountain in caves and could last several days. Clays were traditionally used at both. The lengthy sweats were attended only by men and involved the extensive use of clay. Skilled medicine men of the tribe presided at these sites as the tribal fathers awaited spiritual vision. Seasonal migration of the Indians would take them to sites of warm clay pools. The complete submersion of their bodies in clay held significant ceremonial purpose. It also served to cleanse and heal their bodies. As it was tribal custom never to be without the edible clays, supplies were dried to be carried on the homeward journey. The use of clay by the American Indian was held in each tribe's tradition; it was shared only among the tribesmen. The seeking of clay took them to specific places, especially where the bubbling mud had brought sedimentary deposits to the surface in active or extinct hydro-thermal activity. On rare occasions, clay would be pastel blue, green, or pink. However, most were grey or reddish in color. This was due to extensive mineral concentrations, especially iron left by the continuous evaporation of water in bubbling mud. The hydrolysis and fragmentation of clay minerals in the heat and steam of a hydrothermally active site, is much more complete than in the sedimentation stage. The clay minerals may otherwise be only mildly transformed in various other ways. 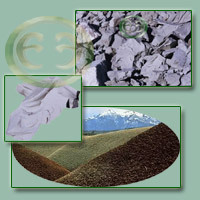 Climatic effects do give rise to different types of clay minerals. Modern scientific research enables us to determine the geographic zone wherein the initiation of the clay minerals' evolution began and what benefits it may have to the human body. Weston A. Price, MS D.D.S. After reading the above, one might wonder how widespread this behavior is in nature, and if these "choice clay deposits" are rare. It's excellent to note that the Peruvian parrots have no need to ingest clay if they are consuming their ideal diets. Their choice to eat fine clay is predominantly a healing instinct, similiar to that of the dog that chooses to eat green grass when ill. The truth is, the instinctual behavior to eat edible quality clays is widespread, and is shared by horses, dogs and cats, to name a few. To give an example, while residing in New Mexico, we inadvertently left a 5 gallon container of hydrated green clay ( American Colloid 325 Mesh Technical Grade Sodium Bentonite ) outside overnight. Sometime during the night, neighborhood dogs overturned the container, and by morning all of the neighborhood animals had completely consumed the five gallons. In areas where no natural deposits of edible clay exist, such as in cities and developed rural areas, animals which have acclimated to unnatural environments with unnatural diets will often crave clays, and take advantage of any opportunity to ingest some good hydrated clay.